Labor Day is coming!!! I'm super excited because around here, Labor Day means long days by my in-law's pool plus lots of family, fun, and foods. The kids spent every possible moment in the swimming in the pool and exploring the backyard while the grown-ups hang out on the deck (with occasional dips in the water). In lieu of cooking up one big meal, we spend quite a bit of time just snacking on food. Chips, dips, and the like. And let's be real, snack foods are the best kind of foods. I love grazing all day! 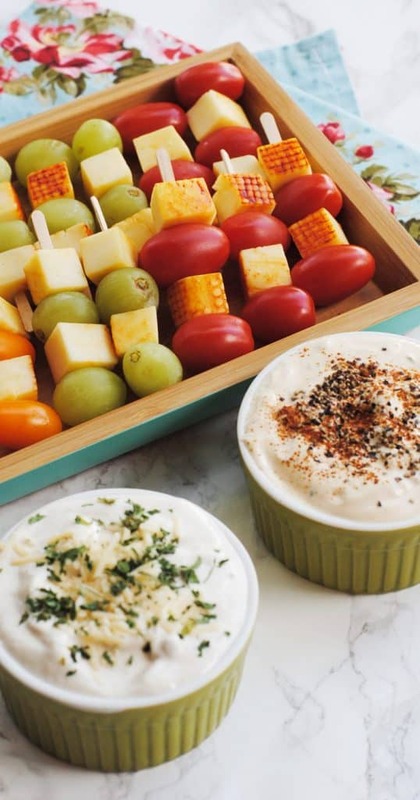 Honestly, the traditional chips and dips offerings are timeless and classic but this Labor Day, it's time to get creative about the way we dip! I'm going to bringing some out-of-the-chips-and-dips-box to the party this year. 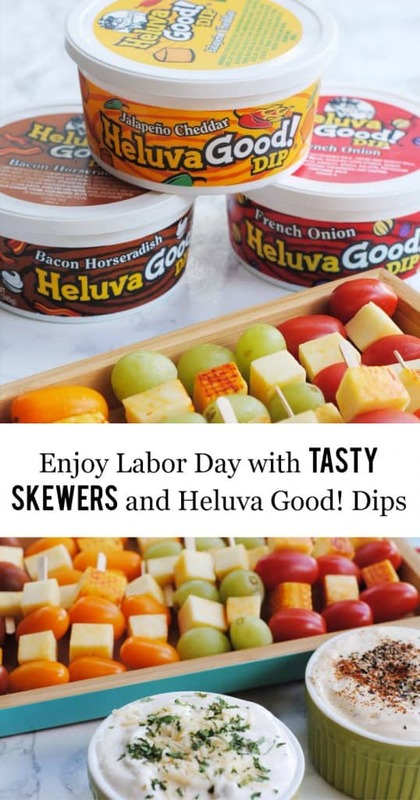 Check out how I'm going to enjoy Labor Day with tasty skewers and Heluva Good! Dip, who provide the ultimate snacking experience no matter the occasion. I find that when serving snack foods at a summer gathering, it's best to stick with easy to dip finger foods. That way, people can “customize” the food to their specific tastes and preferences plus, it encourages experimentation. I always like to go past the obviously chips, pretzels, crackers offerings and incorporate fruit, veggies, even cheeses and meats! 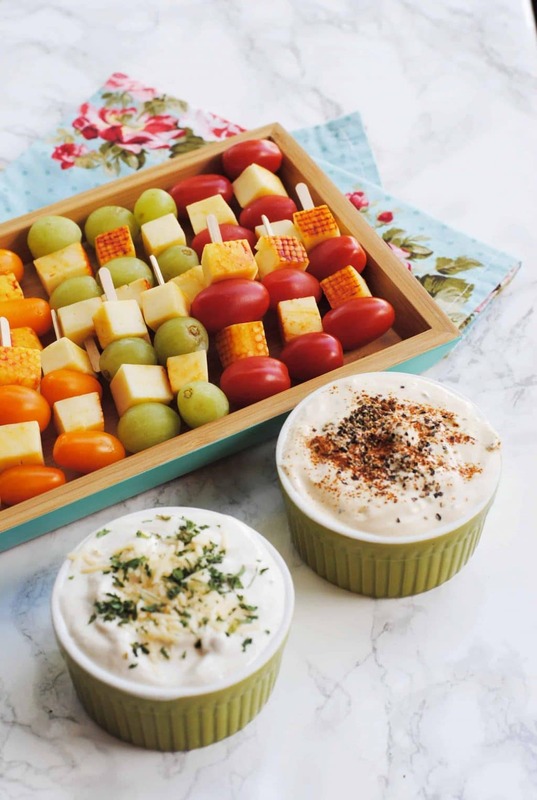 For example, I don't think that any poolside get together would be complete without a dip to sink some fruit and cheese skewers in. Have you made those before? So easy and tasty! I like to buy mini skewers (the ones that look like the wooden ones you can buy at your local supermarket for kabobs but are half the length) and thread cubed cheeses, grapes, berries, and tomatoes on them. Cheddar and grapes are a great pairing while I like muenster and tomatoes as another option. 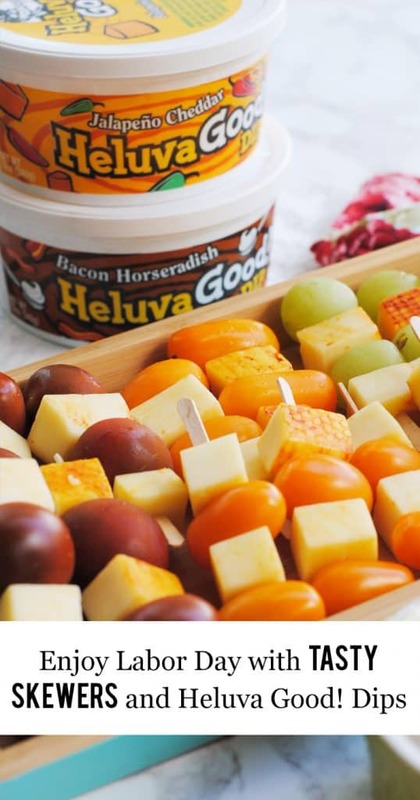 As far as dips go, I tend to just pick a couple of tasty options from any one of Heluva Good! Dip‘s amazing assortment of flavors like, French Onion, Buttermilk Ranch, White Cheddar & Bacon, and Bodacious Onion. Each dip is made with real sour cream and flavorful spices so they are beyond tasty and you can always find a solid option that will go with your finger food. Find them in the dairy aisle of a store near you (my HEB has so many to choose from!). I paired my skewers with French Onion and Bacon Horseradish for an unconventional tastebomb! So, what dipper will you be using with your Heluva Good! Dip this Labor Day? Share them with Heluva Good! Dip on their Instagram feed, their Facebook feed, or on Twitter for some amazing out-of-the-box dipper inspiration! Be sure to tag them and use the hashtag #ChipsDipsandTips when you post.